Bright eyes are an essential part of every look - they're always in style. But, finding the right products to target areas that need improvement, while covering current imperfections is not a small feat. If, however, you're armed with the right arsenal of products - it's something that can be tackled in an instant and save you in the long run. 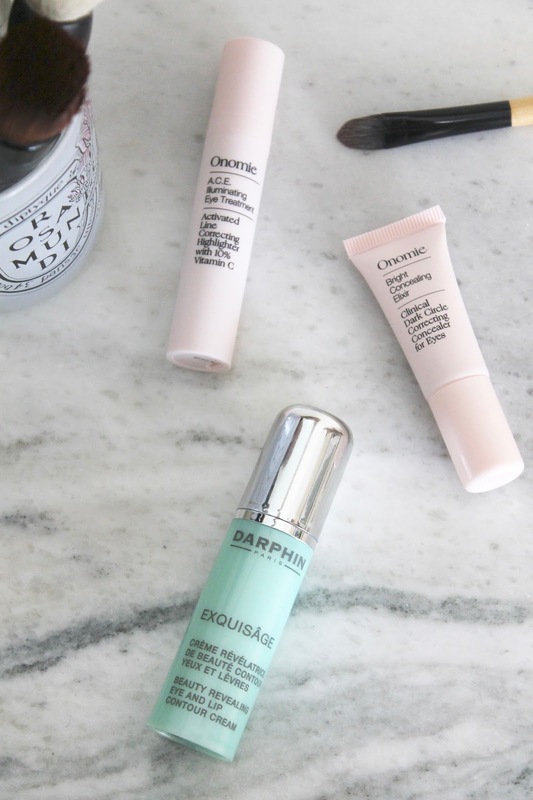 Treat - The newly launched Darphin Exquisâge Beauty Revealing Eye and Lip Contour Cream is perfect for targeting expression lines and signs of fatigue on both eyes and lips. The soothing, cushiony formula includes Celluvie Complex, which has been shown through in vitro testing to double the production of collagen in 72 hours by revitalizing cellular energy. It also contains various botanicals to aid in defeating signs of aging, minimize dark shadows, restore luminosity, instantly soothe and moisturize. Illuminate - While reaping the benefits of your long term treatment, add an instant illuminating cream to the area for instant brightness. The Onomie A.C.E. Illuminating Eye Treatment has a mousse-like texture and a pearly pink tone that counteracts shadows upon application. It also contains a potent dose of Vitamin C to help permanently brighten the area over time. Conceal - After you're eyes look substantially brighter, apply just a dot of the buildable, yet moisturizing Onomie Bright Concealing Elixir to cover the remaining shadows and darkness. Believe me - I've tried all the under eye concealers...and this one is a winner in my book. I love how moisturized and comfortable this keeps the area feeling all day, and how it also works to diminish dark circles with a targeted treatment as well.